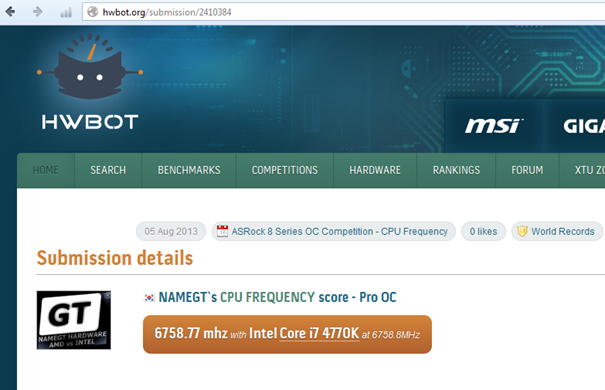 The HWBOT Competition Engine (“HCE”) was built to help overclocking communities host their internal forum challenges. 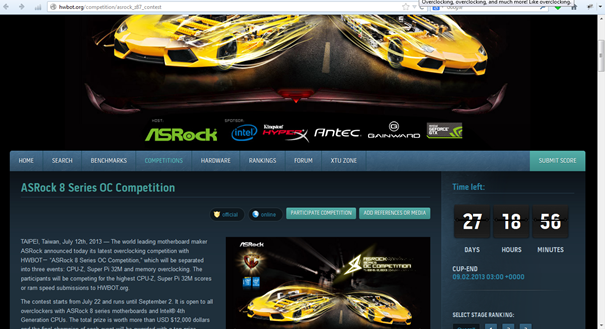 After the first conceptualization in 2009, HWBOT decided to make this feature more flexible so it could also be used for global overclocking competitions. 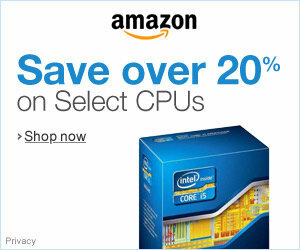 HCE is in essence nothing more than an extension of the HWBOT engine. This means that participation, rankings, results and everything else related to the competition is built on the same foundations as the normal rankings and competitions at HWBOT. This way, participating users understand how the competition works in an instant. One very important aspect of HCE-based competitions is that we do not force anyone to participate. By this, we mean that every single submission to the competition was submitted by the user and not at random. The participation figures are indicating actual participation rates. Or else, every single participant of a HCE competition is active and interested! 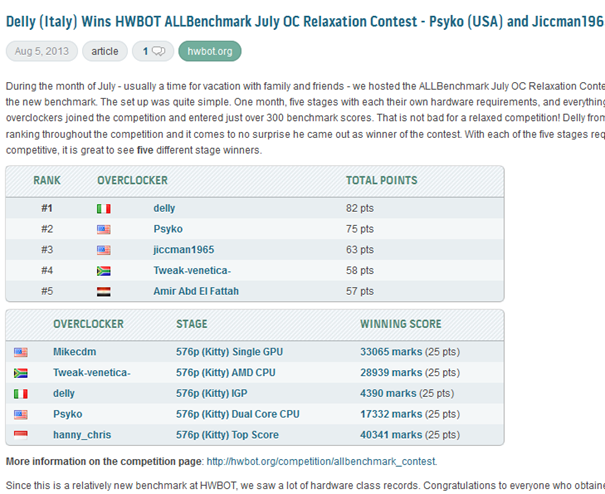 At the moment of writing, August 1 2013, HWBOT has hosted 150 competitions featuring over 550 stages, engaged 2109 unique overclockers from 81 countries to submit over 18,000 results. 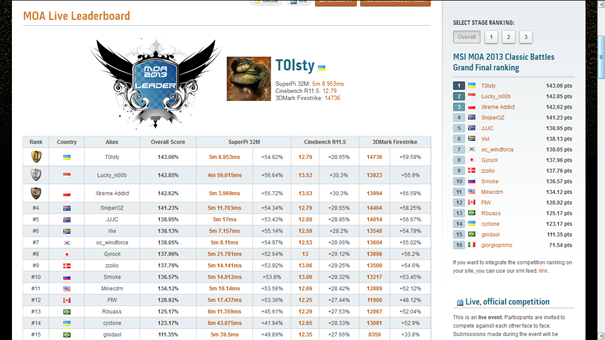 Our most successful competitions include the HWBOT Country Cup 2011 with over 1,000 overclocking results submitted. 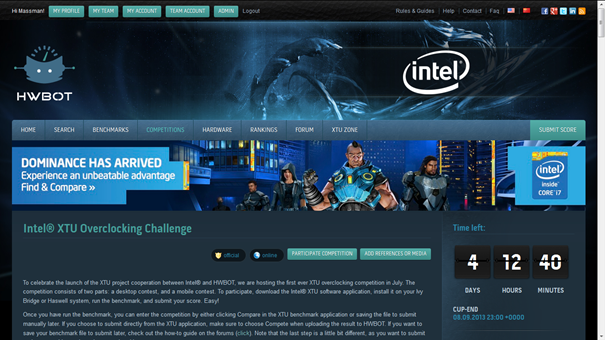 HCE exists since 2009, and has been used to host prestigious online competitions and qualifiers for industry-leading companies such as Intel, GIGABYTE, ASUS, MSI, GSKill and ASRock. Travel and hotel cost is not included in the package pricing, and depends on the location of the live competition. The HCE Live! requires minimum one HWBOT staff member to be present on the premise to manage the scoreboard.